When I heard that Brad Paisley was going to be playing in Jackson, I decided to check when his tickets went on sale and was disappointed to see the show would be on a Thursday night. I also saw in his listing that he would be in Birmingham on a Saturday, so for the heck of it, I checked to see what kind of ticket I could get. When a 3rd row ticket popped up for me, I decided I'd make the trip to Birmingham. Blaine Larson was on the bill. I believe he said this was his first show on the tour with Brad. His set lasted about 30 minutes which, with his sound system, was about 28 minutes too long. I have no idea if he's any good or not. I'm not going to go out of my way to see him again, but I'm not going to say he was bad because the sound left much to be desired. Carrie Underwood's sound was not much better than her predecessor's. However, when her musicians played more softly and she could be clearly heard, it was obvious that she does have a great voice. Her set included Jesus Take the Wheel, Don't Forget to Remember Me, Before He Cheats, and Some Hearts. However, the song that got the best reaction was "Sweet Child o' Mine." Yes, that "Sweet Child o' Mine." The audience was pumped to hear this classic, which only goes to show that a great song defies genre and that the people who bought "Appetite for Destruction" in the 80's are the ones buying "Time Well Wasted" today. I've never seen Brad Paisley before, but I had heard good things, specifically that he put on a fun show and was a great guitarist. He didn't fail to disappoint on either count. Brad is a very fan-oriented performer. He consistently made contact with the audience members, threw at least 100 picks into the audience, and even signed a few autographs at the end of the show. His set included Celebrity, The World, I'll Take You Back, Easy Money, When I Get Where I'm Going, Whiskey Lullaby, Mud on the Tires, Alcohol, Me Neither, Wrapped Around, Dixie Land Delight and I'm Gonna Miss Her. The video clips used in his stage production are sometimes campy and corny, but they make a very amusing addition to the show. My only complaint about Brad's show is that it was entirely too short. I was disappointed that he did not play my two favorites of his songs, Flowers and Waiting on a Woman. Both are album tracks and, understandably, his set was focused on his many hits. There are so many potential hits on Time Well Wasted, that I wish he had played long enough to showcase how good that album is. Even the title track was left off the set list. He started after 9:30 and ended at 11:00. Curfew at most venues is 11:00, so this show should have started prior to 8:00 PM, had one opening act instead of two, had shorter sets from the opening acts, or at the very least had less down time between set changes. 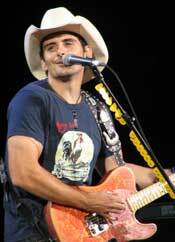 I'd recommend a Brad Paisley concert to country music fans. His show is fun and family-friendly. If you listen to the radio or watch CMT, you'll know most of the songs in his set. Also, this would be a nice show to take your kids to (and that's not an insult). All generations were well represented. I won't be traveling all over the country to see Brad, but I would like to catch his show once or twice a tour. I might go to Jackson as well.